Indonesia (/ˌɪndəˈniːʒə/ (About this sound listen) IN-də-NEE-zhə or /ˌɪndoʊˈniːziə/ IN-doh-NEE-zee-ə; Indonesian: [ɪndonesia]),[lacks stress] officially the Republic of Indonesia (Indonesian: Republik Indonesia [rɛpublik ɪndonesia]),[lacks stress] is a unitary sovereign state and transcontinental country located mainly in Southeast Asia with some territories in Oceania. Situated between the Indian and Pacific oceans, it is the world's largest island country, with more than seventeen thousand islands. 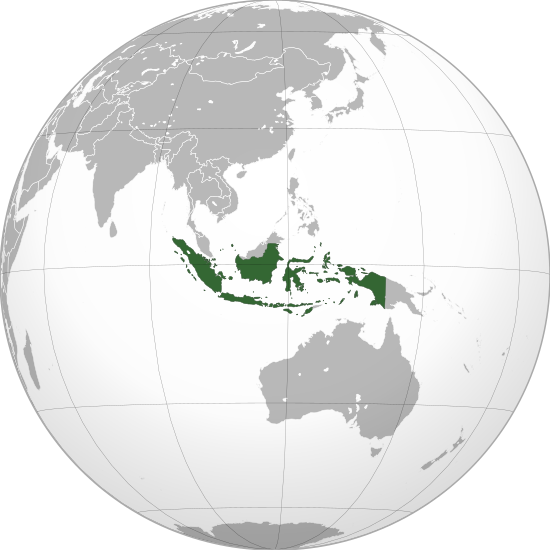 At 1,904,569 square kilometres (735,358 square miles), Indonesia is the world's 14th-largest country in terms of land area and world's 7th-largest country in terms of combined sea and land area. It has an estimated population of over 260 million people and is the world's fourth most populous country, the most populous Austronesian nation, as well as the most populous Muslim-majority country. The world's most populous island, Java, contains more than half of the country's population.